Sequel can't see the forest for the trees. The phrase “lightning in a bottle” gets tossed around so often that it’s long since lapsed into musty cliché, but that truly is the best descriptor to apply to 1999’s The Blair Witch Project. That microbudget indie sensation had an immensely transformative cultural impact. It singlehandedly created the modern found-footage horror subgenre, further popularized by Paranormal Activity and its ubiquitous brethren. It still stands as one of the most successful independent films of all time, as well as, for a time, the single most profitable film ever made, from a budget-to-gross perspective. It shook up the horror genre at a time when Scream clones were the law of the land. Hell, it even essentially invented viral marketing, with its elaborate, mythology-building website. But the true legacy of The Blair Witch Project lies with its scrappy ingenuity, its canny ability to weave a spooky campfire yarn and then stick you right inside of it. Its account of three student filmmakers shooting a documentary about an entity that is said to haunt the Black Hills forest outside of Burkittsville, Maryland, but ultimately filming a first-hand account of their own doom, possesses an unblinking authenticity, such to the point that its tall tale was widely believed to be true upon the film’s release. Watching The Blair Witch Project, you never receive the comfort of movie artifice, the relief of clear-cut fiction. In a niche genre that cheats constantly, this film never does. It works because it feels so hauntingly genuine. Given the horror genre’s unbending need to sequelize anything that ever made a buck in profit, the question quickly arose of how to fashion a franchise out of something as singular as The Blair Witch Project. An attempt was made with 2000’s Book of Shadows: Blair Witch 2, which paradoxically wedded more conventional horror thrills to an unconventional through-the-looking-glass conceit, examining where fiction and reality dovetail and diverge using The Blair Witch Project (a work of fiction in the sequel’s universe as in our own) as a focal point. Each of these two approaches were not only completely wrong for the Blair Witch mythos, but were at odds with each other, resulting in a film that was an unqualified mess and a notorious failure. Book of Shadows snuffed out the Blair Witch machine in its infancy. Despite several efforts by creators Daniel Myrick and Eduardo Sanchez to mount a third film, there would be no further ventures into the woods for well over a decade after. Honestly, it seemed to be for the best. Then, late this past July, an announcement was made out of the clear blue sky that the impending horror film The Woods, which unmistakably owed an obvious debt to The Blair Witch Project, was actually a covert sequel to the original film. Director Adam Wingard, who has made a name for himself within the horror genre with You’re Next, The Guest and contributions to the V/H/S series, had secretly crafted a return to the Black Hills, centering on the brother of original lead documentarian Heather Donahue as he leads a new group of amateur filmmakers into those same woods to find out what happened to his sister 20 years earlier. Revisiting the original’s found-footage structure, albeit with more cinematic polish, the new film looked to be the sequel fans wanted Book of Shadows to be. So is the unimaginatively titled Blair Witch worth the nearly two decades it took to arrive? The answer is a definitive…sort of. College student James Donahue (James Allen McCune) has been obsessed with his sister’s disappearance all his life, and when a new tape is unearthed of her plight in the woods, he is motivated to see if Heather could still be out there. He is joined by student filmmaker Lisa (Callie Hernandez), buddy Peter (Brandon Scott), Peter’s girlfriend Ashley (Corbin Reid) and Lane and Talia (Wes Robinson and Valorie Curry), the pair of kooky locals who discovered this latest tape. The group sets off into the woods, armed with such state-of-the-art film equipment as drones and ear-mounted digital cameras, gadgets that would have seemed straight out of Star Trek to Heather, Mike and Josh in 1994. Setting up camp on their first night, the group is immediately besieged by creepy forces, though it quickly grows unclear how much of the phenomena is genuine and how much is being generated by Lane, who is obsessed with the Blair Witch legend and seems keen to put on a show for the crew’s cameras. Wingard’s reverence for the original is clear from the start. Not only is he faithful to the film’s vérité house style, but he also incorporates much of the Blair Witch mythology into Lane’s stories to the group, some of which was only known to nerds like myself who combed the website and ancillary materials. Where Wingard errs, however, is in how he unspools this new group’s plunge into chaos. In the original, Heather, Mike and Josh very gradually come undone, their torment mounting incrementally with each passing night, creating a slow descent into madness. Here, Wingard throws his characters straight into the deep end. Though the first night’s findings are shown to be the work of Lane, the second night’s encounters (and there are only two nights in the film) come fast and furious. Apparently taking the “nothing happens!” criticism lobbed at the original to heart, Wingard doesn’t display that same slow-boiling patience. He can’t wait to start picking off his characters, Friday the 13th-style. No time for filming rocks, Dr. Jones. Miscalculations are also made in terms of the content shown. It’s important to recall that The Blair Witch Project never showed us anything incontrovertibly supernatural. You could watch that film and easily surmise that the trio was beset by locals, forest dwellers or even each other. That’s what made it so spooky, that you never see the thing that’s hunting them. This being a sequel, a certain amount of escalation is anticipated, so there was no reason to assume that same ambiguity would remain in place, but some of the sights Wingard shows us feel off-brand for a Blair Witch film. Ashley sustains a foot injury early on that manifests itself as gory body-horror, with objects queasily making their way out of her wounds. More alarming is another gruesome bit where one of the trademark stick figures is shown to have voodoo-doll properties, leaving a body mangled upon its snapping. And in the climax, where we do finally catch a few glimpses of the witch herself, she looks to be disappointingly of the same shrieking, rampaging ilk as the antagonist of any post-The Ring horror film. Wingard loses sight of the fact that less was more where the original was concerned. Another problem is the characters here aren’t so hot. Heather, Mike and Josh might have been grating, but you truly got a sense of their personalities as their ordeal worsened, to the point where Heather’s filmed confession near the end carried a real emotional punch. You never get that same connection with this new group. First off, James’ quest barely even makes any sense. He was four years old when Heather disappeared, so we’re asked to swallow the notion that he’s obsessed with finding a sibling that he couldn’t possibly have any substantial memories of, to say nothing of the fact that there’s no reason in the world why he should suspect that Heather is still alive out there somewhere (I guess she liked those woods so much that she abandoned society to live in a hut out there?). Logically, this premise would have made much more sense if the film had taken place only a few short years after the events of The Blair Witch Project, but they didn’t make drones in 1997, so no dice. James and his comrades never emerge as anything more than stock horror-movie avatars to be systematically knocked off. Say what you will about her, but there’s a reason why we still remember Heather Donahue’s name after all these years, whereas I saw this movie last night and had to look up these characters’ names for this review. Wingard does pull a few other tricks out of his sleeve that are interesting, yet seem an ill fit with the Blair Witch brand. He takes the ball and runs with the concept that the reason Heather, Mike and Josh kept walking in circles is that the witch somehow reconfigured geography to keep them in her trap, a notion hinted at in the original while also being plausibly attributable to the characters’ weariness and fractured mental state. Here, not only is geography constantly, unambiguously in flux, but time itself also appears to be manipulated by the witch. Some members of the group experience days at the same rate that others experience hours and, at one point, night simply doesn’t end the following morning so that the witch can continue her pursuit. This is intriguing, but also kind of a cheat. Heather, Mike and Josh may not have enjoyed a level playing field, but at least the sun still worked. More intriguing is the idea, introduced conversationally early on and put to the test in the climax, that the witch can only kill you if you look at her, like she’s the Ark of the Covenant with its lid off. This results in a neat bit where the last survivors refuse to open their eyes while the witch attempts to bait them into doing so, but it also has the effect of diminishing the famous standing-in-the-corner move as a way to stay alive rather than a creepy ritual to be subjected to before being killed. If it sounds like I’m dwelling too much on Wingard’s missteps, let me also say that he does a fair amount right as well. His is a much more grueling, punishing Blair Witch than the first, with a heavy dose of Evil Dead also in its DNA. 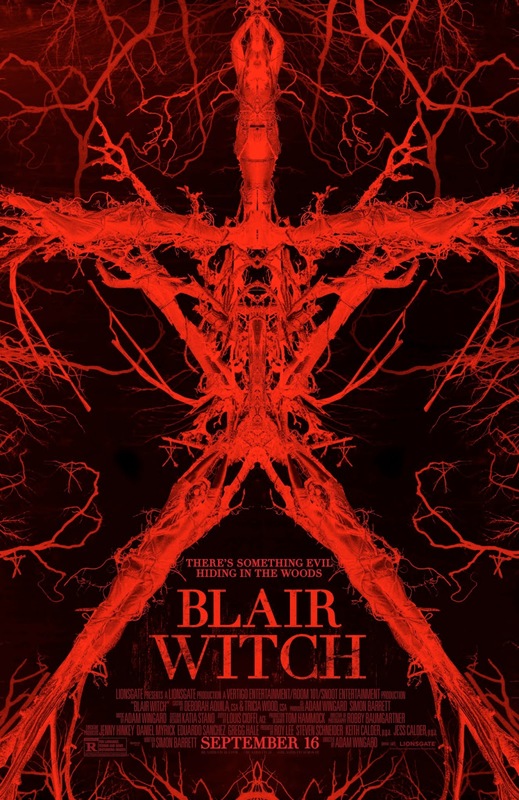 While it discards the slow-burn nightmare of the original, it must be said that this Blair Witch keeps the tension running high once it gets going, rarely letting up. Its best bit is one unlike anything from The Blair Witch Project, more akin to The Descent, with one character attempting to smoosh herself through a very narrow dirt tunnel to escape a locked cellar, the claustrophobic pressure growing increasingly unbearable. Despite the ways in which this film is at odds with the tenets of what we think of as The Blair Witch Project, it remains largely effective as a teeth-gnashing exercise in sustained anxiousness. And after all, a sequel that qualifies as serviceable is something that would have seemed as welcome a sight to fans in 2000 as a populated area would look to any of the series’ characters.